Tonight’s dinner was definitely a success! 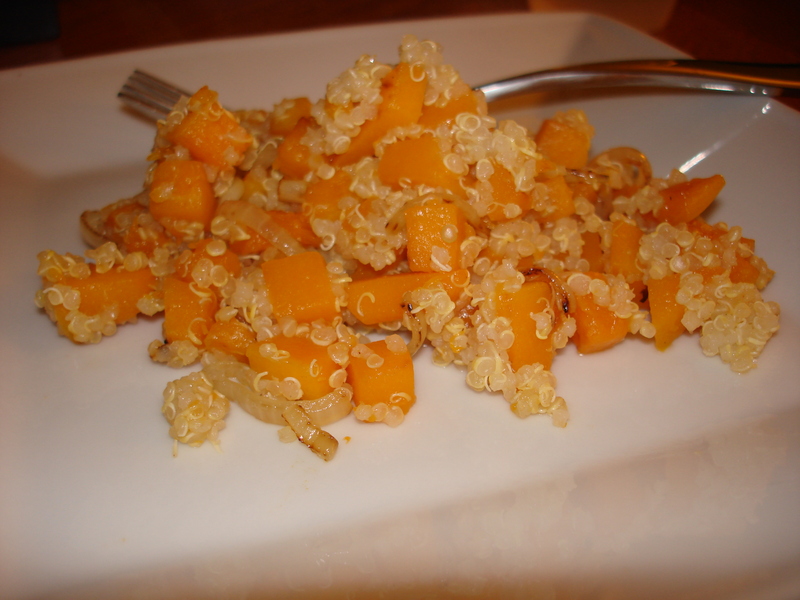 Into a saucepan, place the quinoa, water, ginger, nutmeg, and lemon juice – cover and cook over low heat until all liquid has been absorbed. In a separate skillet, saute the onions in olive oil until caramelized. Set aside. Add the squash to the now-empty skillet and stir occasionally. Saute squash until slightly browned and tender. Add the honey to the squash and stir to coat. Remove from heat and stir in the onions and quinoa. Whenever we make a dinner, we always decide if it’s a “make-again” recipe. This one definitely was. It will also be leftovers for lunch tomorrow. Hooray! Today was a decent day. Nothing amazing, but not bad. Dinner – Angela’s Speed It Up Spinach and Chickpeas. We both loved it! Definitely a “make again” recipe. Dessert – a honeycrisp apple with some of the frozen PB banana dip. The rest of the dip I ate as ice cream with a little hot fudge. AMAZINGNESS!!! 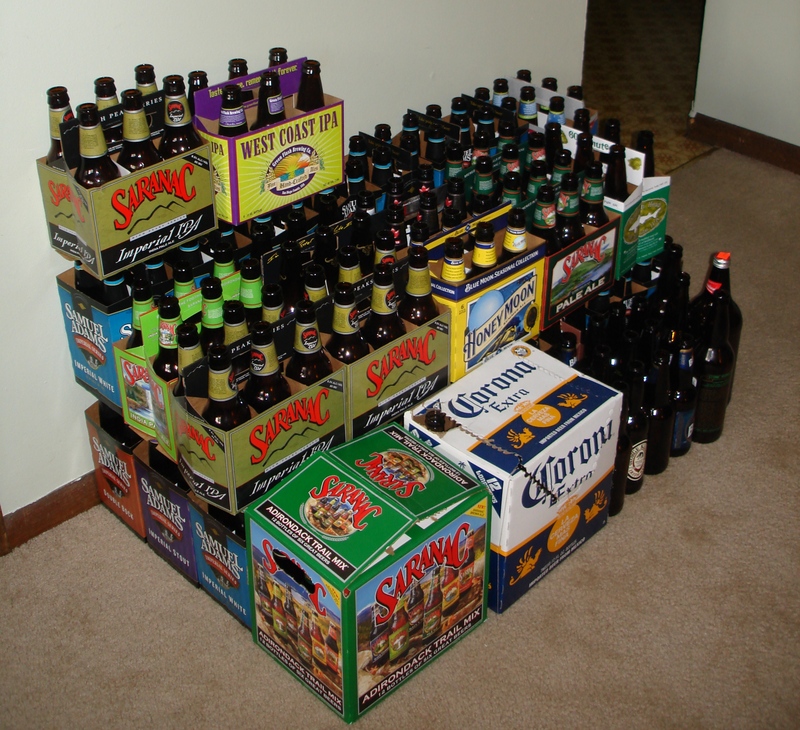 229 bottles! I promise I don’t live in a frat house. These have been building up since July 2009. We also got to take the dogs for a walk around our neighborhood. My husband’s knee is healing well! He had his ACL repaired in early January, and today he was fine walking 2 miles with me and the dogs at a pretty decent clip! I’m so glad he finally got that done. I did get my run in today, although it wasn’t quite as much as I had hoped. I only got halfway (8.5 miles). Everything was achy and It was a generally unenjoyable run. Not awful, but I wanted to stop before the discomfort in my knees turned into searing pain. I’m proud of myself for getting my run in, but a little disappointed that I only got 8.5 miles done. In hindsight, I probably shouldn’t have done the speedwork yesterday. I know you shouldn’t do two hard workouts in a row, but I was kind of dumb about the planning. My New Vegan Ice Cream Love! Oh my! I am in love! And I’m not just talking about my husband! 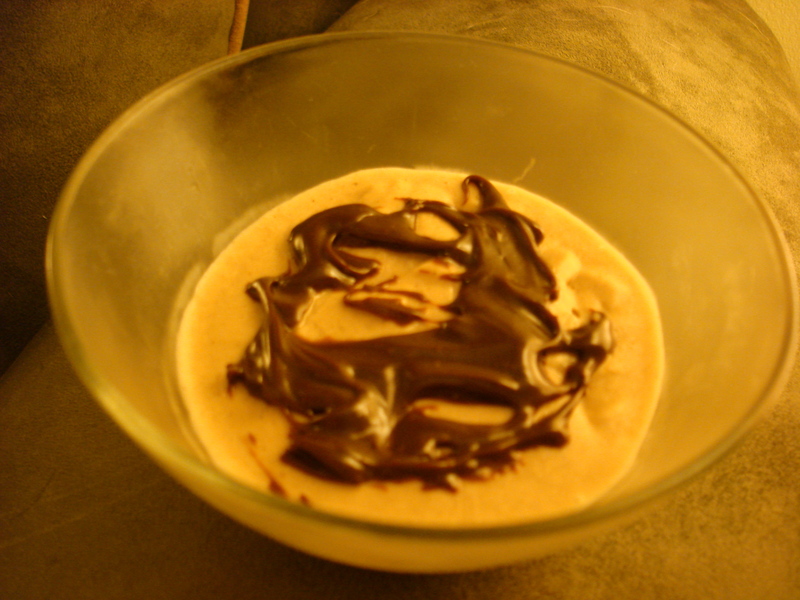 Tonight I tried that PB banana dip as an ice cream and it was AMAZING!!! I know my pictures are bad. Please bear with me until I can afford a nice camera! Blend all ingredients together and let harden in freezer before serving. Green monsters are smoothies! They are delicious and wonderful, and GREEN! 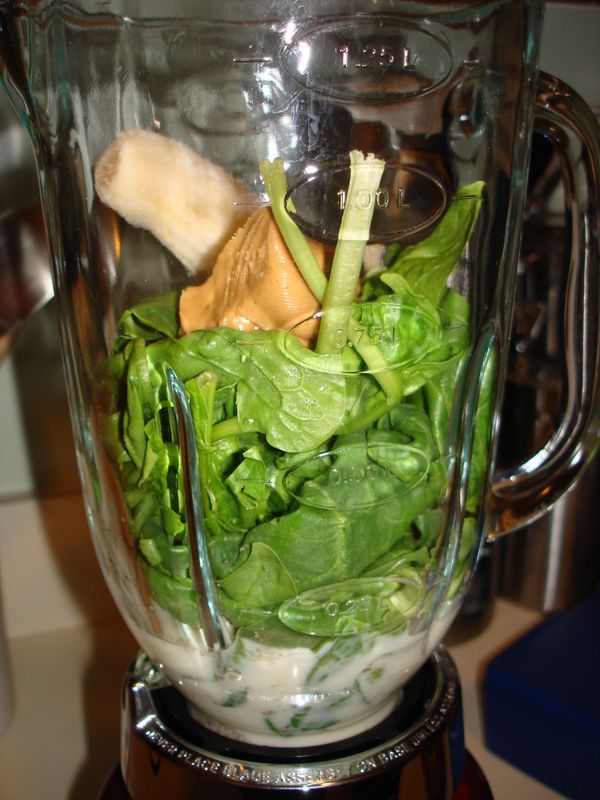 It turns out that raw spinach has basically no flavor, so when you mix it into a smoothie, you don’t taste it at all. 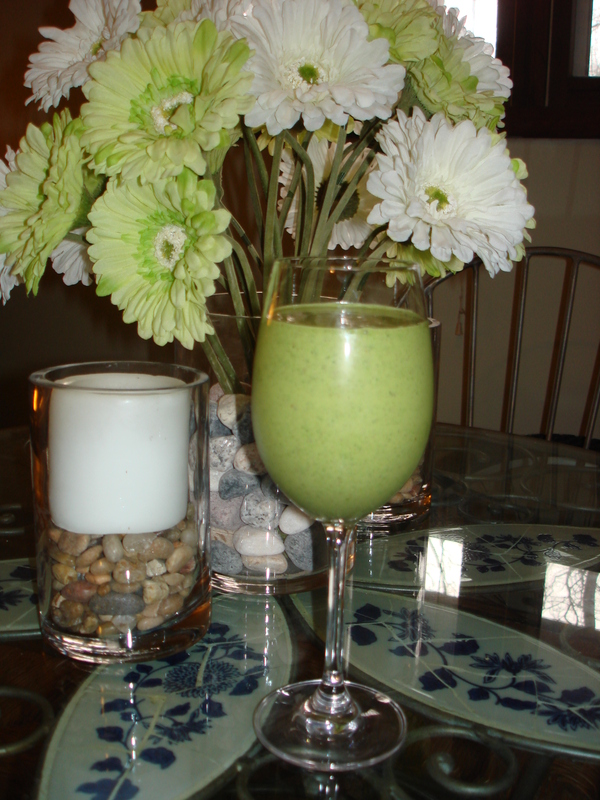 Instead, all you taste is your delicious smoothie, PLUS you get all the nutritional benefits of the spinach. Here’s a great website (by Angela of Oh She Glows) for more info on green monsters! A tip: If you want to get someone to try them, make them close their eyes first and then give it to them. I did this to my husband and he liked it. Then he opened his eyes and saw that it was bright green! Today was generally a very lazy day. 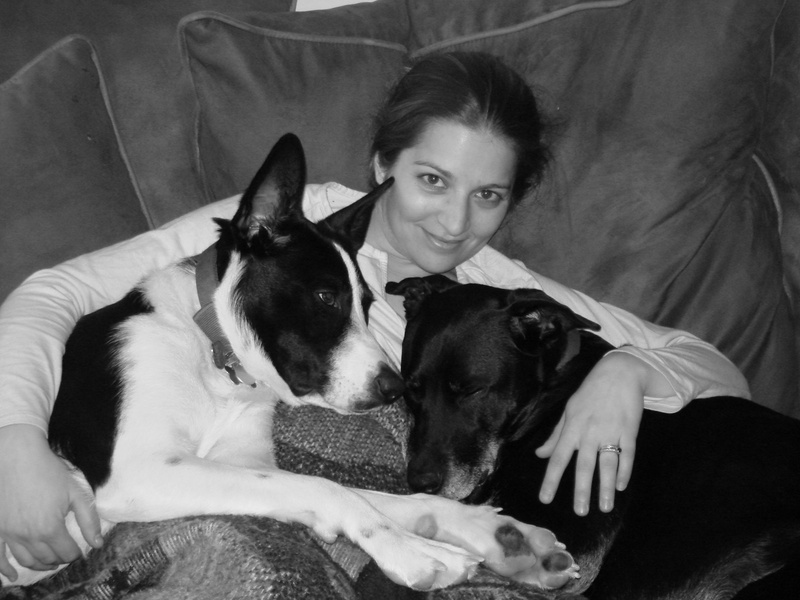 We all (myself, my husband, and the dogs) slept in way later than we should have. We then proceeded to lounge around in our PJs for most of the day. I did a lot of cleaning, and FINALLY finished shredding all the papers and receipts that I have been working on for about three days (uugh). What’s that? That’s right, it says 8:55 per mile! Woot! 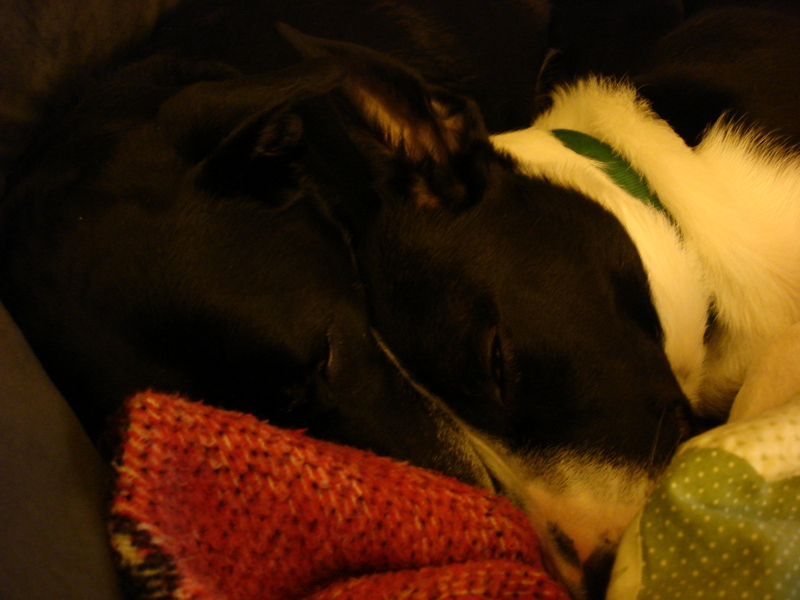 Jade and Rocket are both currently passed out and sprawled across my lap – making it very difficult to type! Tomorrow I have 17 miles planned. I was going to do a fun little 5 mile race, but we have a lot of errands to get done during the day and I don’t think it’s going to fit in (I didn’t register yet anyway). So I’ll just run around here for my 17 miles instead. Maybe I’ll actually get a long run outside??? My only problem with that is that we live on a very busy 55 mph road and I can’t really run right out our door and do 17 miles. I would have to drive somewhere – and don’t currently have any ideas for where. If you lived on a busy road and couldn’t run around your “neighborhood,” where would you do your long runs? Thanks for all your responses lately! I myself have a hard time balancing the fuel intake pre-workout, and I’m no where NEAR even mid-distance yet, let alone long distance! I have had a few “long activity” workouts (intervals for 6 miles, for example) and I always feel like I have either fueled TOO much, or NOT ENOUGH for the long workouts. How do you find a balance? I find that eating intuitively makes a big difference. Check out “Intuitive Eating” (by Evelyn Tribole and Elyse Resch). If you want a more “numbers-based” approach, you might want to check out a Go Wear Fit or a Bodybugg – they’ll give you a good ballpark number for how many calories you’re actually burning every day. Then you can use something like The Daily Plate or Sparkpeople to keep track of your calorie intake (I use The Daily Plate). I’m currently combining those two approaches. I keep track of my food intake, but that’s mostly to see my fat/protein/carb ratios. Since switching over to vegetarianism, I find my fat intake has gone through the roof – although nuts are a good source of protein, they are also very high in fats. I use my Bodybugg to see how many calories I’m burning on a daily basis, and I try to stay somewhere in that general vicinity with my calorie intake. I try not to obsess about it, and just use my hunger cues (intuitive eating). But then I log it afterwards to see how things are adding up. It’s a strange combination, but it seems to work pretty well for me. Also remember, it’s a process. Some foods will work well for you and others won’t. The more you pay attention to how different foods make you feel (eating intuitively), the better you will be able to plan your meals and your runs. I’ve found certain foods that make me feel great, and others that just destroy my runs. But now I know what to stay away from for a day or two before my long runs. Apparently I DO need to continue my daily check-ins. This week at work was very stressful (but ended up being extremely successful) and included several nights staying on campus until much much later than normal (as in 9:30pm). Now that it’s Friday, I spent the entire night 1) going to doggie agility, and then 2) sitting on the couch, computer on lap, thinking about how I really should go down to the basement and run. I am still on the couch with the computer and it’s now 11:40 pm. Whoops! Don’t skip a planned workout unless ABSOLUTELY necessary (as in injury or illness) – it’s very, very hard for me to get back on track after I do. Make sure I eat enough to fuel my runs! I think part of my awful February was because I was underfueling and bonking on my runs (when I actually made it down to the treadmill, that is). Cutting back on the sugars makes a world of difference. Whenever I eat processed sugars I feel absolutely awful for the rest of the day. Natural sugars seem to be fine (like those found in fruits, honey, etc. ), but those processed sugars just ruin my whole day. I’m actually already looking forward to training round #2 because I’ll be on summer vacation for the whole thing (except the last two weeks, but those are the taper anyway). So I’ll be able to make sure I get my runs in, and get my strength training in. I feel like overall, it’s going to be a much better experience than this time around. Trying to cram marathon training in to the busiest semester I’ve had so far (and probably will have for a couple more years) is just not fun. I know I’ll be able to do the distance when the time comes, but I’m not expecting any miracles. But that’s okay! I’m learning – every day is a new challenge. After reading Nicole’s post about imperfections the other day, I started to think about the things that I do to myself that undermine my goals. I love goals and plans. I have a lot of them. But I also have a lot of things that I do on a daily basis that get in the way and drag me back down. I’m sure everybody does this in one way or another, but that doesn’t make it any less frustrating or difficult. It seems like often in the food and fitness blog world, there are people who are too perfect. Everything they eat is healthy, organic, clean, and wonderful. They love working out every day and never have a bad run, or a bad patch of workouts. I never like reading those blogs because it makes me feel like I am some kind of health and fitness failure. I know I’m not a failure at this. I’m normal, just like everybody else. We all struggle with things. Some days are good, others are not so good. I’ve been fortunate to never have an actual weight problem. I say “actual” because I have been a healthy weight all my life, but I still deal with some major body issues to this day. Although I am only 5 feet tall, I’ve always been in a reasonably healthy weight range. At my absolute highest, I weighed 132 lbs – although nobody would have ever guessed it, because I’m fairly muscular (thanks sports!). I usually float anywhere between 120 and 128 lbs. Now, even though I know all of this, I still look at myself in the mirror, or feel that little roll around my middle when I sit down, and hate myself for it. I didn’t always have this problem. And I still know the exact moment it began, where I was standing, what I was wearing, and what happened that made my brain start thinking this way. On one of my visits home during my second year of college, someone I am extremely close to and completely respect and love said something along the lines of “put on a little weight, huh?” I need to point out that at this point I was still in the perfectly healthy range, but yes, I had gone to college and gained about 5 pounds. Before that moment, I never once thought badly about my body. Ever since that moment, I have not had a single day of my life where I have not thought about my weight, my body, and every morsel of food I am eating and want to eat. That was seven years ago. As hard as it is to admit, I struggle with disordered eating on a daily basis. No, I am not anorexic (I love food too much to not eat! ), or bulimic (um, yuck?). I struggle in a different way. I love food, but any time I eat something that isn’t 100% healthy, I feel extremely guilty about it. I obsessively count calories and restrict my caloric intake to just within a “healthy” range – your body needs a minimum of 1200 calories per day just to support basic life functions. On days when I am “good,” I’ll eat around 1200-1400 calories. However, this catches up with me and whether it’s a couple days or a couple weeks later, I end up stuffing myself silly because I haven’t been eating enough. When this happens, I feel extremely guilty, or I try to eat without other people noticing (like before my husband gets home). Then I’ll go back to being “good” to make up for my “bad” behavior. (here’s a useful information sheet from the NEDA). Now see, even though I know this is not a healthy mental state, I’ve been in it for seven years. Fortunately, over the last year, I have become extremely interested in fitness (even more than I was before) and nutrition – go figure. Now that I am educating myself on these topics, I am gaining the tools I need to readjust my mindset. I started by getting a copy of “Intuitive Eating” (by Evelyn Tribole and Elyse Resch). I’m not usually one for “diet” books, but that’s the thing with this book – it’s NOT a diet. It’s actually very anti-diet. Eating intuitively is about thinking about your food, your hunger cues, and paying attention to how you are feeling before, during, and after eating. Since reading this book and paying more attention to how certain foods make me feel, I learned how physically awful I would feel after I would eat junk. Since becoming a vegetarian, I’ve really started to love cooking and trying new foods. I’ve found a lot of healthier alternatives to things that I used to gorge myself on, and because of intuitive eating, my tastes have also changed. I read a lot of great food and fitness blogs, and Katie had a great idea a while back. Whenever I think I want to eat something, I ask myself “am I hungry enough to eat an apple?” Unfortunately, I now love apples (thank you, vegetarianism), so this isn’t always the best question, but you get the point! I also started using my Bodybugg again. 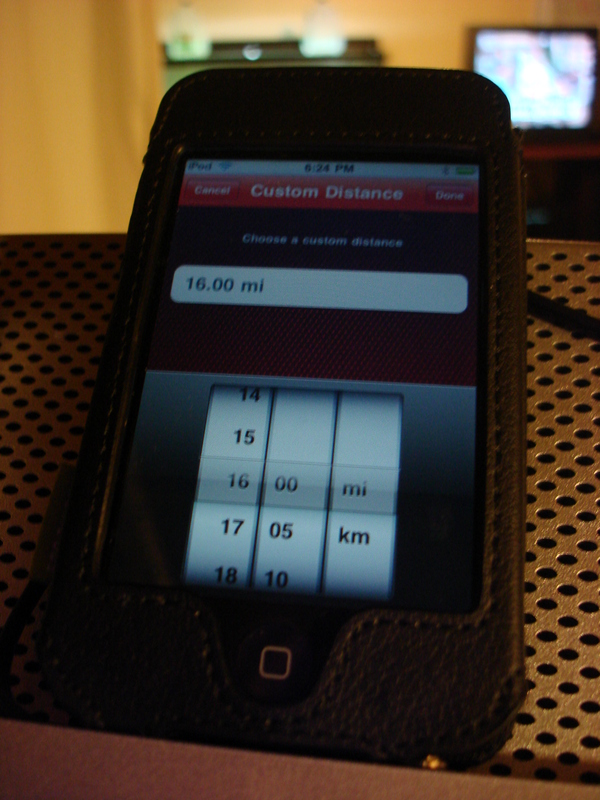 Since I am training for a marathon and running 20-40 miles a week, my daily calorie burn has significantly increased. However, with my food obsession, I was still trying to restrict my food to 1200-1400 calories per day. This was resulting in me feeling fatigued, weak, grumpy, nauseous, you name it. Since I wasn’t sure how many calories I was actually burning with all that running, I pulled the Bodybugg back out from the closet and started tracking that again so I can get my food intake to match my activity level. So even though, yes, I am still counting the calories, it’s so I can make sure I eat enough to fuel my runs. I hope that makes sense… Once I get myself to where I have a good feel for how much I should be eating, I’ll stop the counting and go back to eating intuitively. I’ve also started talking about my internal struggle – with my best friend (who has also had quite a journey), and now here. Sometimes just verbalizing these things makes them more real, and seem more manageable. When it’s all in your head things can get blown out of proportion. I know that I can get myself through this. I’ve already made great strides forward just in the past year. I’ve never gotten to the point that my physical health was in jeopardy – it’s just been my mental well-being that has been beaten up over the years. But sometimes that can seem just as daunting. Anyway, I know this was kind of rambling. Thanks for sticking with me. I’ve been sitting here tonight feeling like I wanted to write something, but I didn’t know what. And then I realized it was this. So I rambled a bit. Random fact about me: I love music. 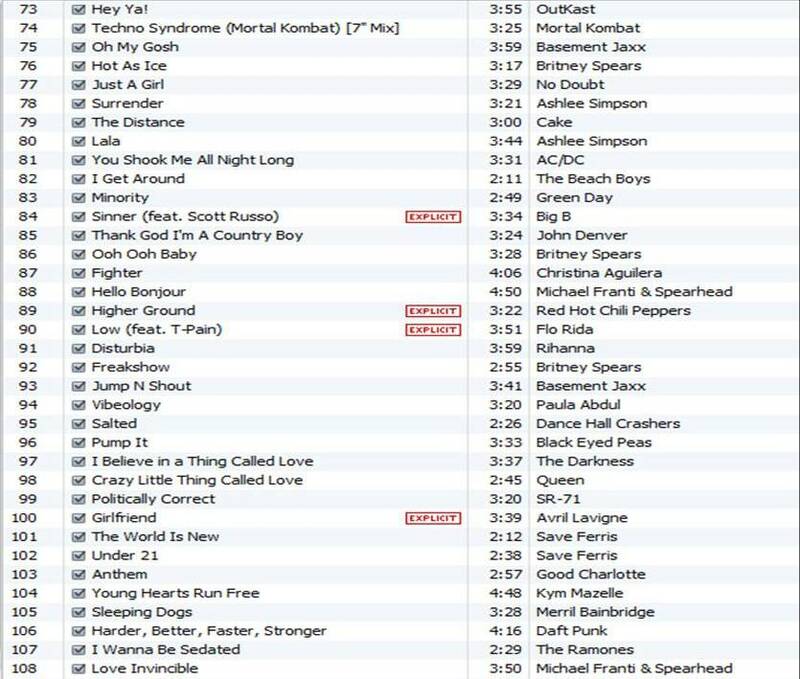 Since I love music, and I love running, I love making running playlists! On the health and fitness forum I post on, there are always people asking about good workout/running songs. 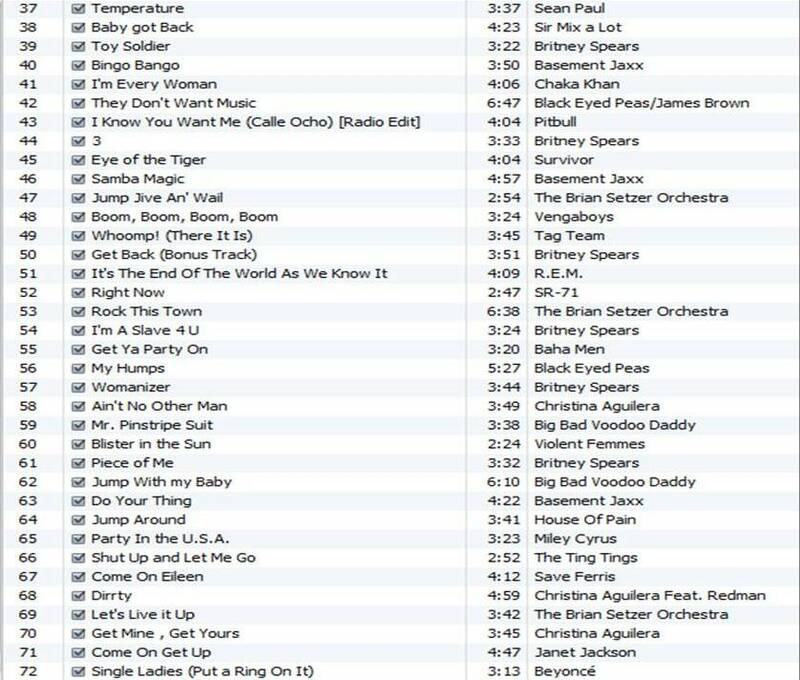 So I figured I’d post a copy of my most recent playlist on here. 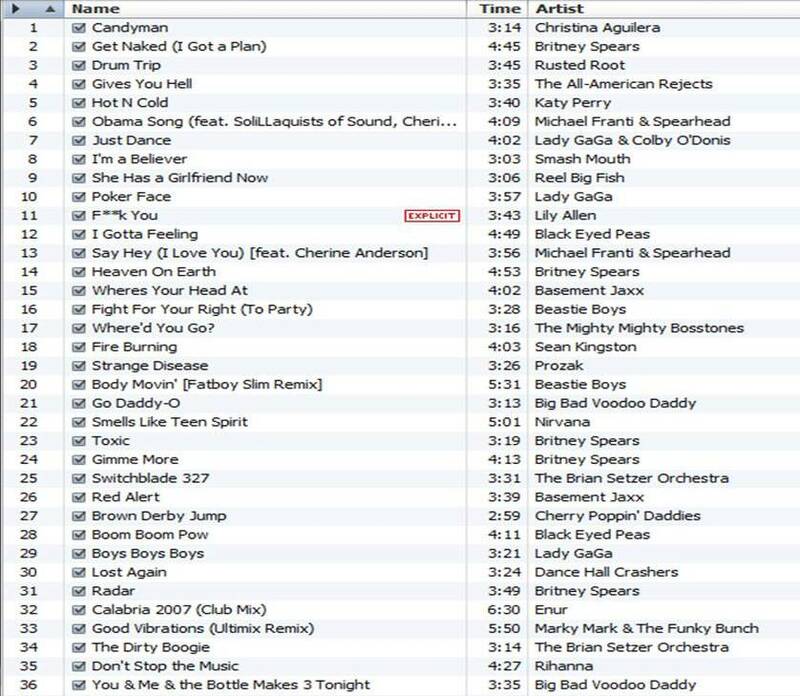 My current favorite running song has got to be “Candyman” by Christina Aguilera. Every time that song comes on I get happy and run faster. So Sunday I planned on doing my long run (16 miles). First things first, I got to do yardwork. Yes, yardwork. And we live in an apartment complex. They don’t take care of anything here. So I got to rake for a couple hours. Fun fun fun. That was a good workout in itself. But at least now I can (potentially) plant some veggies out there! Around 6pm I was finally ready to get my run in. I don’t normally like starting this late, but there were a lot of distractions that day. 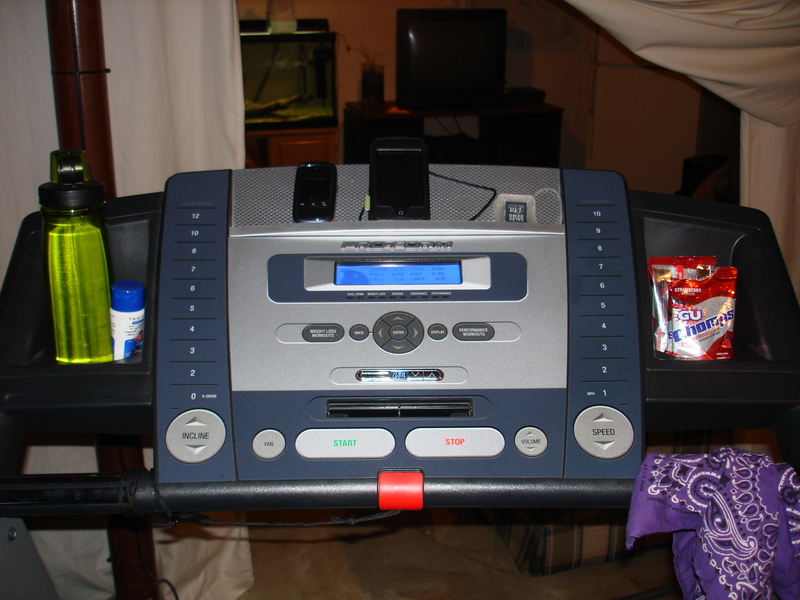 Since it was already 6pm and it was going to be dark before I finished, I headed down to the basement to run on the treadmill. I love that I don’t mind knocking out 16 miles on a treadmill now. There’s something oddly cool about that. My little running bubble. 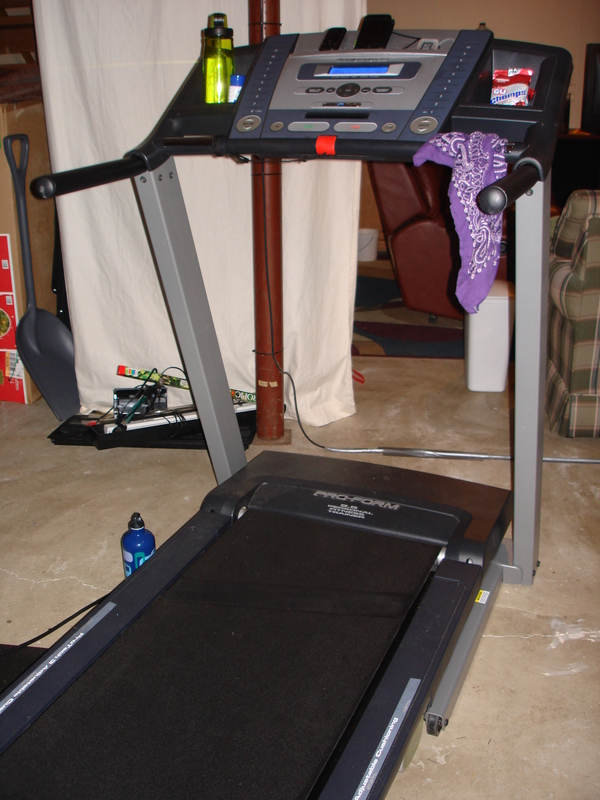 We have a Proform 8.5 Personal Fitness Trainer Treadmill. I LOVE IT. 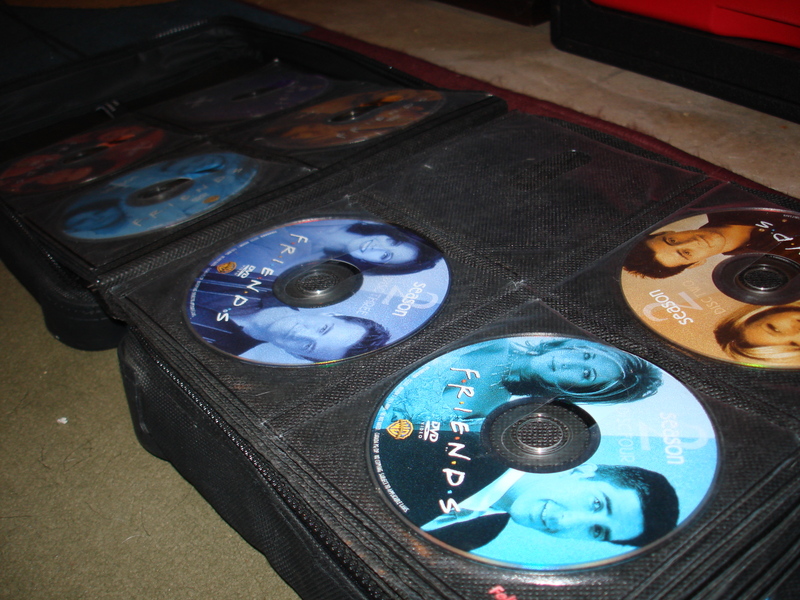 My long run entertainment – This run was Season 2, Disc 2. 7.5 more seasons to go! 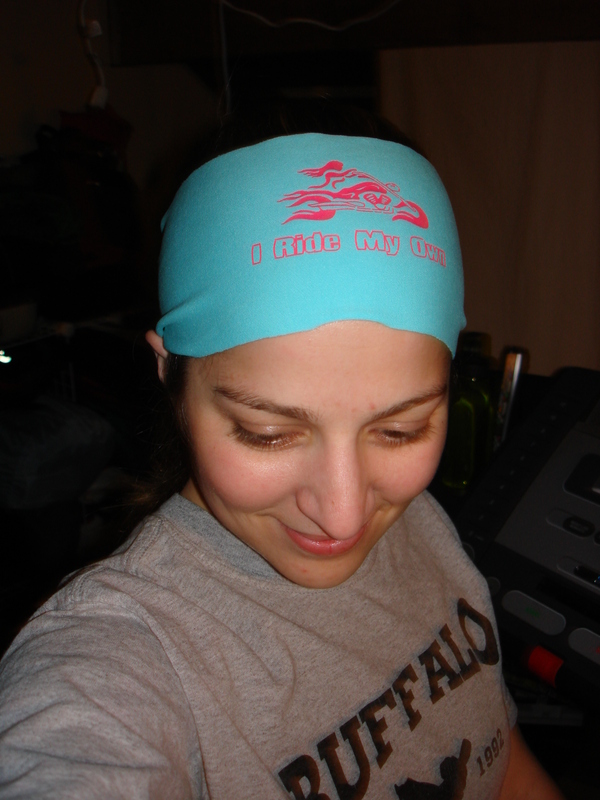 This was my first run trying out my new Bondi Bands! I got three headbands the other day and I was super excited to see how they worked! My biker chick one – the other two are a pretty floral pattern, and a 26.2 one that I won’t wear until I cross the finish line. It’s my motivation/reminder. The Bondi Bands are super lightweight material so I didn’t really notice it when it was on. It’s larger than a normal headband, but you can fold or roll it if you want. I wore it flat and wasn’t bothered by how much of my head it covered. Overall, I liked it! Getting situated. 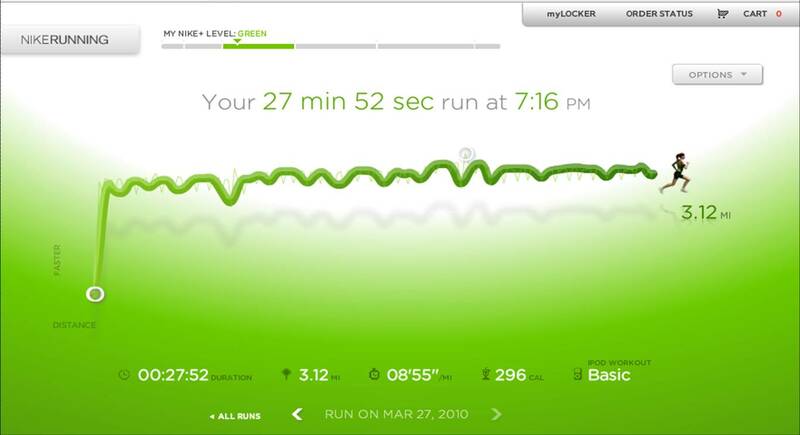 I LOVE my Nike+! 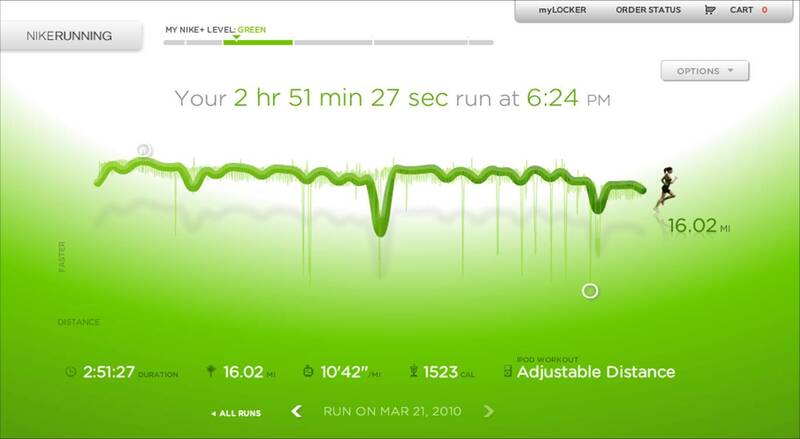 That big dip in the middle was when I hopped off the treadmill to reset it. Hooray! This was my longest run to-date. After having a month and a half of crappy runs, skipped runs, and not enough runs, I am very proud of myself. The first 12 miles felt alright. Nothing spectacular, but no major problems. At mile 12 my knees started to tighten up, but I stuck it out. For the last two miles I was running like a 90 year old, but I did it. If you’ve gotten this far, thanks for sticking with me! I won’t keep posting daily updates (maybe every 2 or 3 days? ), but it definitely makes me think twice about skipping a run if I know I have to write something about it later. Perhaps I’m getting back on track. There are 70 days left until my marathon. It’s not much time and I need to keep on going!